The Eagles have not been good this year. #Analysis. Rest-of-season SOS ranking: 6th. The Eagles' toughest remaining game, according to FPI, comes in Week 15 when they travel to Los Angeles to play the Rams. 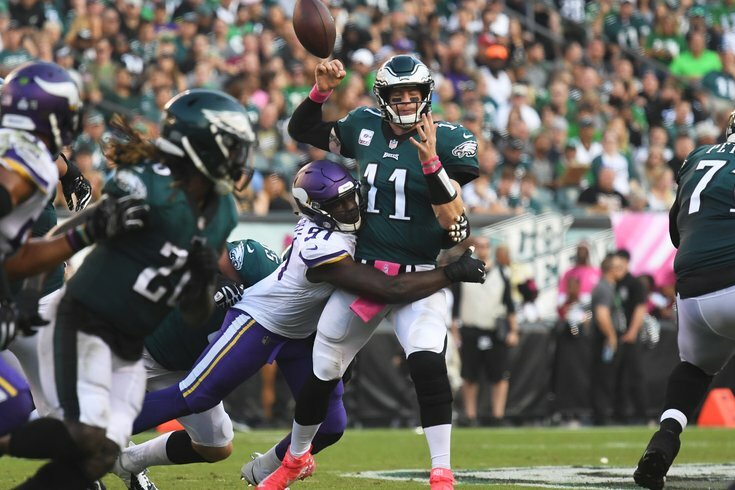 FPI gives the Eagles a 20 percent chance to win, and it is part of a stretch in which the Eagles are not favored to win three of four games. #JimmySays: To note, every week, ESPN has a theme for each team. This week it's remaining strength of schedule. And hey, guess what... It's not going to get much easier the rest of the way. Also, ninth?!? Really? Has ESPN watched the Eagles play this season? Sure, maybe Alshon Jeffery could've held onto that Carson Wentz ball to convert third-and-20. But that, at least to this spectator, was not the key moment of the game. (Not to mention: Jeffery was decidedly walloped on the play.) No, the crucial play was the third-and-1 that Minnesota converted from their own 44 with around five minutes remaining. The Eagles had pulled to with six at 20-14, and a stop there would've given them the ball back with plenty of time to use the entirety of their playbook. Instead, no one picked up Kyle Rudolph on a delayed, shallow drag across the formation, nor made the tackle on the lumbering tight end until he had picked up 17 yards and set the Vikings up in field goal range (which Dan Bailey eventually paid off with a 52-yarder). Now, I'm not Philadelphia's defensive coordinator, but I'm pretty confident LB Kamu Grugier-Hill fell asleep at the wheel, watching Rudolph stride right in front of him and directly in the path of Kirk Cousins' loving eyes. Ballgame. Side note: The Jay Ajayi-to-IR news came out of nowhere, which might be where the defending champs are headed come January if they don't turn it around fast. #JimmySays: The key moment of the game, clearly, was when Lane Johnson got beat by some scrub DE for a strip sack, and the fumble was returned for a touchdown by Linval Joseph. The Eagles desperately need to take care of business Thursday at the Meadowlands before a stretch of schedule that goes Panthers, Jaguars, Cowboys, at Saints. #JimmySays: That they do. Things can really go sideways, even more so, if they drop that game. At 2-3, they hardly look like the champs of last season. The offensive line is holding this team back. #JimmySays: It's remarkable that the OL has gone from the best in the league a season ago to whatever this current mess has been. Team suffering from Super Bowl hangover and in dire straits at RB is also type that might wager Le'Veon Bell rental would provide spark. #JimmySays: Bell would certainly make some sense with Ajayi done for the season. Likely not happening. Jay Ajayi’s torn ACL doesn’t help the Eagles, but you’d think they have the depth at that position to overcome it. If Corey Clement can stay healthy, he has a real chance to become a breakout star. Or … Le’Veon Bell? #JimmySays: The Eagles are ranked ahead of the Jaguars and Bears here, two teams that have been much better so far this season. The defending champs are struggling on offense; they haven’t scored more than 23 points in a game this season. It’s worth noting that only one of the previous seven reigning Super Bowl champions to start a season 2-3 reached the playoffs. History says that the odds aren’t good for teams in the Eagles’ position to turn things around. #JimmySays: I'm curious about the context of those seven 2-3 teams. I'm guessing they didn't play in a division as craptastic as this year's NFC East.